At last week’s IDC Directions conference, I made a point to attend all the sessions geared toward solutions providers. And wouldn’t you know, each session was centered on the importance of the cloud. If there was one message that they were trying to get across, it was that cloud computing will only increase in popularity over the next few years. For now, solutions providers should take advantage of certain services that are ready for the cloud, including Storage as a Service, email and batch processing. Sensitive data and third-party software with no cloud licensing rules topped the list of those areas not ready for a move to the cloud. · Customers only pay for what they use and can pay on a subscription basis. · Cloud applications are easy to get up and running quickly. · Sharing systems with partners is simpler. To get customers on board with cloud computing, according to IDC, it’s very important that solutions providers offer competitive pricing and detailed service-level agreements — and that they have the ability to move cloud offerings back on premise for customers. For now, private clouds seem to be preferred, later this year and into 2011, IDC says customers will lean toward hybrid environments — a mixture of public and private clouds. 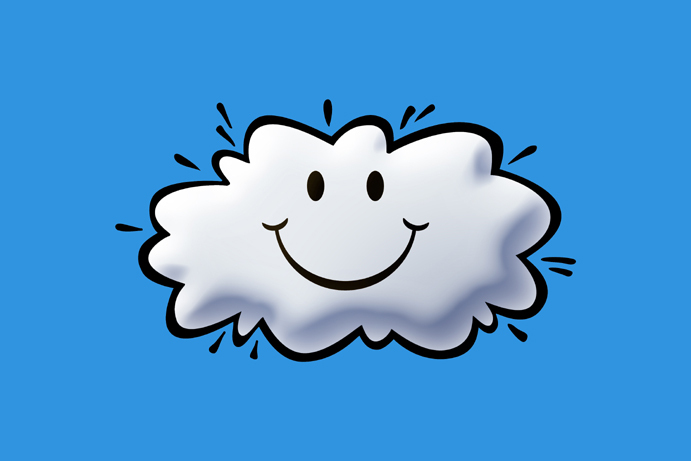 IDC isn’t the only one that’s gone cloud crazy. During a speech last week to University of Washington computer engineering students, Microsoft CEO Steve Ballmer said he’s going “all in” on cloud computing. Ballmer said that 70% of Microsoft’s employees are working on cloud computing projects, and by the end of 2010, that number is expected to reach 90%. Just in case Balmer saying that he’s “all in” for the cloud isn’t enough for doubters, the slogan also appears on Microsoft’s Cloud Services website.